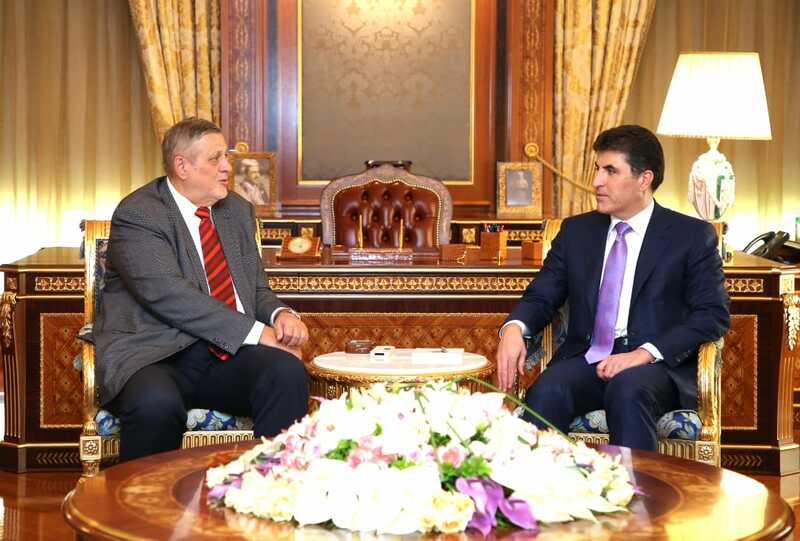 Prime Minister Nechirvan Barzani received Mr. Ján Kubiš, Special Envoy of the Secretary-General of the United Nations to Iraq and his accompanying delegation. They discussed the latest developments in the political process in Iraq and the formation of the new Iraqi government. The delegation stressed the need to form a new government soon after holding the first meeting of the Iraqi Council of Representatives. Prime Minister Barzani stressed that the Kurdistan political parties seek to accelerate the formation of a national government, and work together with the winning parties on a joint plan for the future of Iraq. He pointed to the talks of a joint delegation of the Kurdistan Democratic Party and the Patriotic Union of Kurdistan in Baghdad, and their efforts for the formation of the new Iraqi government. The situation in the Kurdistan Region, particularly the upcoming parliamentary elections, was also discussed in the meeting. Furthermore, the UN Secretary General appointed Ms. Jeanine Hennis-Plasschaert as new Special Representative for Iraq and Head of the United Nations Assistance Mission for Iraq. Ms. Hennis-Plasschaert brings over 20 years of political and diplomatic experience, having served in many high-level government and parliamentary positions. Mr. Jan Kubis will serve until later in the year.